Elegant toiles or dramatic florals were often used as a point of interest in British and American Center Medallion quilts, 1800-1830. 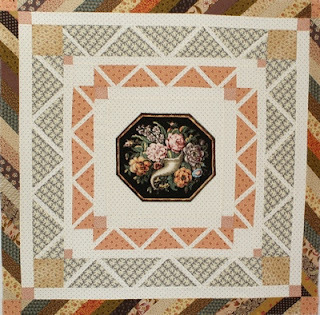 Printed Center Panels, originally designed for pillows and chair seat covers, were especially popular in quilts from 1820-40 in America. 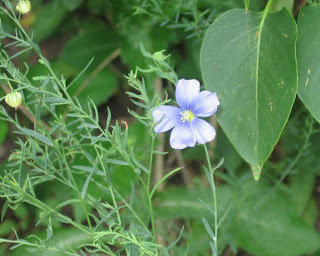 Linen, a natural fiber, along with wool was the main fabric of Europe before the arrival around the turn of the 17th century of colorfully painted cottons from India. Woven linen goods are tan in color and often have brown flecks. 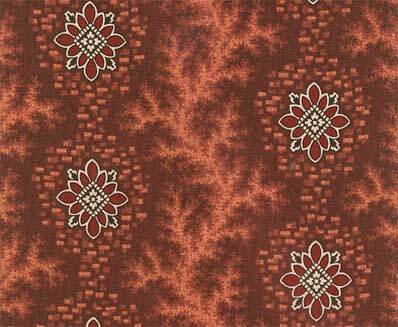 The yardage must be bleached before it can be dyed successfully. The bleaching fields of Haarlem, Holland whiten most of the European linens of the early 18th century. Linen woven during the winter months in England was sent to Holland in the spring. The fabrics were soaked in lye, washed and spread out on the grassy fields in the sun for weeks. The process was repeated numerous times and usually finished by October when the fabrics were returned to England ready for dyeing. The modern chemical industry that developed during the First Industrial Revolution in Great Britain brought us muriatic acid bleaches that eliminated the 6 month long sun bleaching process. Now linen could be bleached in a factory in just a few hours. When I taught Apparel and Textiles last winter here at Montana State University, I would begin each lecture with a current issue that related to the day's lecture topic. Here is a link to an article about 600 year old linen bras. I own nine vintage fabric sample books. 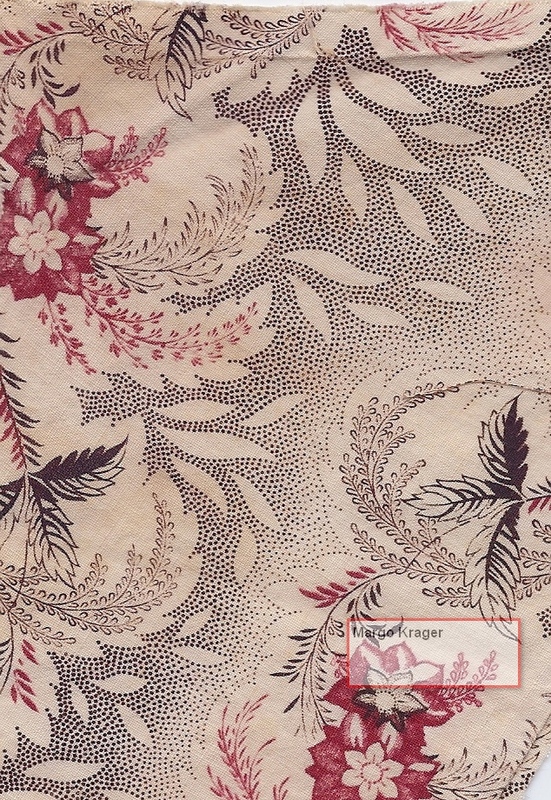 My first and earliest is the Dargate Book....dated c. 1830 by Dr Virginia Gunn, Professor of Costume (retired), University of Akron and Susan Meller, author of Textile Designs. When I lecture about my books, I am often asked about their purpose or use. 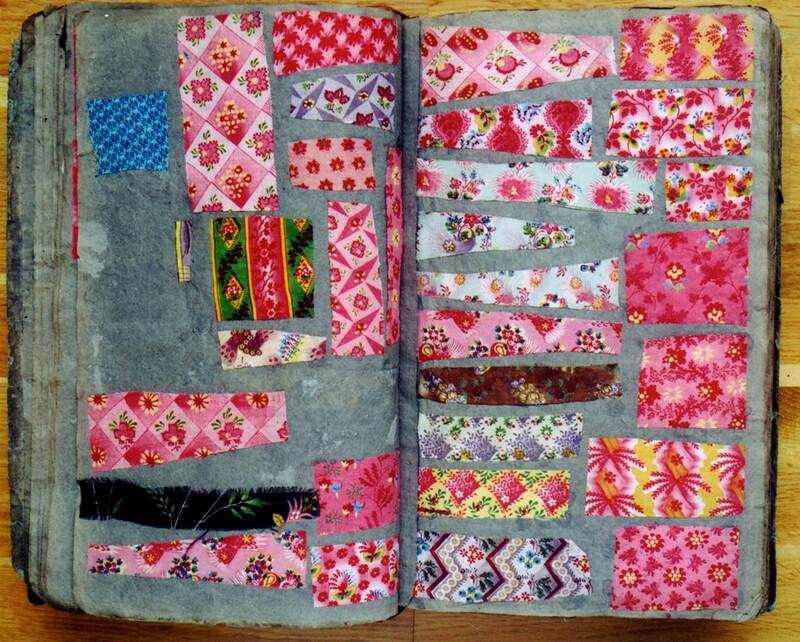 By the mid 19th century, there were fabric swatching services available from Paris. These samples were often pasted into ledger books, along with labels to identify the print houses. I do have a Day Book from an American mill...that shows the patterns printed each day...from 1899-1901. 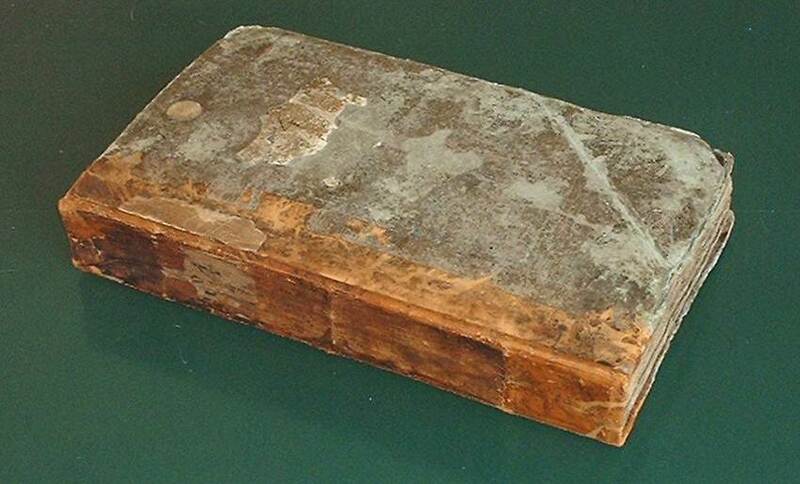 The Dargate Book is earlier. Susan Meller thought the samples were from the Mulhouse region of France. My feeling has always been that they are from different mills from that region because there are many different 'styles' and levels of printing skill throughout the book. 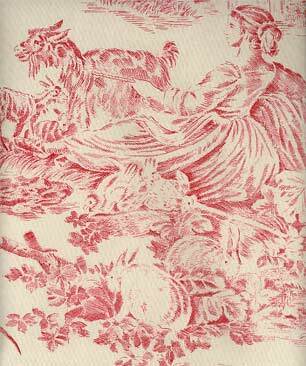 I recently came across a wonderful description of swatch books in the collection of the Jouy factory.
' 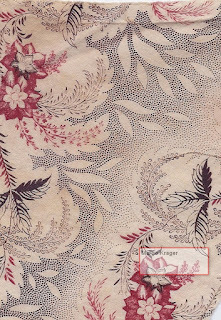 a large collection of printed fabrics ...pasted into ledgers like dried plants in a herbal'....Toiles de Jouy, Riffel and Rouart....page 41. 'High tech' woodblocks often contained embedded nail heads for detailing. This added an element of shading or texture. Thin copper or brass stripes could also be turned on their edges and hammered into the woodblocks to print not only details of a floral motif...such as thin stems and vines...but also backgrounds of twigs. This was known as 'coppering'. Early toiles featured finer details that were possible only with the engraving of the copper plates. Copper roller printing was invented in 1783 but it was not until 1815-20 that this new technology was able to produce a polychrome with exquisite details. Note the delicate fronds and shaded stippling of the sample. The Divers fabrics arrived on Thursday! 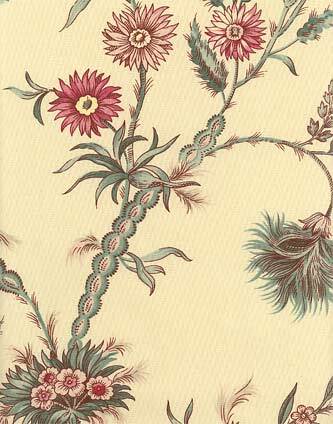 The designs were taken from samples in the book, titled Divers, dated 1863 and probably from Mulhouse, France. The fabrics were dyed with madder and depending on the mordant used, the colors vary from a rust to lavender to almost black. Scale is ideal for a reproduction Civil War Era gown.